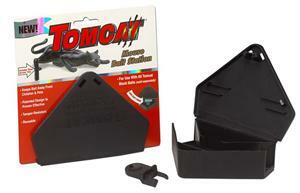 The unique design of Tomcat triangular-shaped rodent bait stations, make the bait station more tamper resistant due to the slanted path to the bait compartment. The bait station can only be opened with the included easy-access key, adding an additional layer of security to prevent access by children and non-target animals. The patented triangular design allows the rodent bait station to easily fits in corners, behind appliances, and in tight areas where mice are likely to travel and nest. Tomcat Mouse Bait Stations hold both block bait and pelleted place pacs, allowing you the option of using your preferred bait.